Board Games - It's taken me a bit longer than usual to wrap up the heroes for Scythe. The detail on them is a little soft so it took a bit more to get me motivated to put them on the painting table to finish up. Don't get me wrong the models are great they're just smallish so the faces weren't the most fun to paint. It didn't help that in the same batch I have a bunch of Shadows of Brimstone and The Others to paint. (both of which are more forgiving and easier to paint). I used the same techniques on these as I did the mechs. The GW texture paint is pretty cool and I think I might add a few more of the colors to my painting supplies for small projects like this. The tiger for the Russian character turned out pretty good. I think this is the first time I've painted a traditional tiger so it was tricky getting he white underbelly right. Given the size and detail level of the model I'm happy with the results. 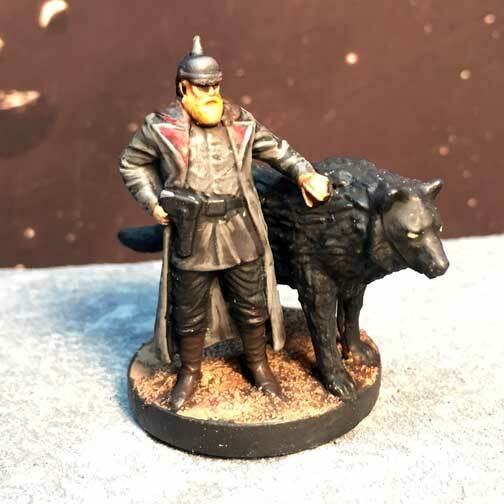 By far the coolest model in this set is the Polish character with the bear. The uniform reminds me a bit of the original Red Dawn which was one of my favorite movies growing up.